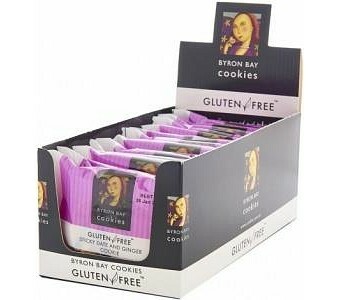 Byron Bays Sticky Date and Ginger cookies are crammed with big chunks of hand sorted dates and walnut halves and have generous lashings of real glace' ginger from Australia's premier ginger grower Buderim Ginger. They are gently mixed to maintain the fruit and nut quality. This individually wrapped biscuit is ideal to take to work or school. Ingredients: Gluten Free Flour [rice flour, tapioca starch, maize starch, soy flour, emulsifier (soy lecithin), thickeners (xanthan gum, guar gum, 464)], butter, dates (15%) [rice flour], sugar, crystallized ginger (8%) [sugar, ginger], walnuts (7%), glucose syrup (from maize), dextrose, fibre, maize cornflour, skim milk powder, soy flour, raising agent (sodium bicarbonate), salt, spices, flavour.